Through third-party development, Drexel University has energized the campus with housing, retail, and dining facilities. All this while maintaining a stable balance sheet and minimizing credit impact. The modern urban university must offer state-of-the-art facilities for instruction and research, as well as high-quality student housing, dining, and amenities, to recruit and retain the best students and faculty. For Drexel University, Philadelphia, those requirements were particularly challenging. Ranked the fifth fastest-growing private, nonprofit, research institution by The Chronicle of Higher Education in 2013, Drexel had experienced a 28 percent increase in enrollment from 2007 to 2014, and a corresponding 44 percent increase in campus square footage to meet the growing demand for instructional, research, housing, dining, and recreation space. One reason for the significant growth—and expectations for even more—was the university’s plan to enhance the overall student experience, and to reflect its shift from a commuter to a residential university. To that end, Drexel implemented the Two-Year Residency Program that required freshmen to live in on-campus university housing and sophomores to live in university, university-affiliated, or university-approved housing close to the core of campus. In addition to fostering a more robust campus experience for students, this program was intended to address community concerns about the number of students moving farther out into the surrounding neighborhoods. In anticipation of the program’s implementation in 2013, the university sought solutions for increasing and improving the available student housing stock closer to the central campus. Faced with the need to expand facilities for both academics/research and housing/amenities, university leaders made it a strategic priority to focus institutional investments on academic excellence, including the upgrading of academic and research facilities. With academically oriented projects receiving top priority in the capital budget, the university needed to look elsewhere for funding to support the expansion of facilities to accommodate the university’s enrollment growth, increasing residential population, and the modern student’s expectations for high-quality campus amenities. Fortunately, in today’s financial landscape, universities need not rely solely on their own capital to fund such modernization projects. There are many ways that institutions can—and should—extend their own capital by leveraging alternative funding sources, including third-party developers, donor dollars, tax credits, and government programs. At Drexel, we’ve had tremendous success during the past four years, forging partnerships with third-party developers to improve and grow residential housing and related amenities, while using a combination of university capital, donor gifts, and government sources to invest in academic and research facilities. The university entered into these partnerships as part of an effort to accomplish four primary goals: (1) modernizing the campus with the types of amenities today’s students demand, (2) focusing institutional investment on construction and improvement of state-of-the-art facilities for instruction and research, (3) keeping new construction projects credit-rating neutral, and (4) generating revenue in the form of ground rent payments. Following are several illustrative examples from our experience in utilizing “other people’s money” to transform the campus landscape. Drexel University’s relationship with American Campus Communities (ACC) began in 2011, when the university embarked on ground lease negotiations with the Austin-based student housing REIT (real estate investment trust). The initial project—to develop an 861-bed student housing and retail complex on an underutilized, narrow footprint between the sidewalk and an existing student center and academic building—was the first of three multiuse projects. 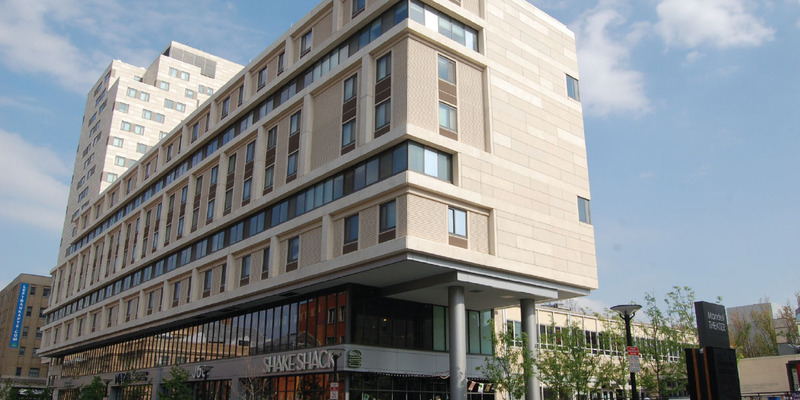 Chestnut Square, a 361,000-square-foot student housing and retail complex, was the first of three third-party development partnerships between Drexel University and American Campus Communities. Chestnut Square. For the first project, Drexel acquired city street setback rights to build on the 51-foot deep site. The $100 million project opened in September 2013, with a 19-story apartment tower, and two eight-story buildings with townhomes and dynamic street-level retail, including a coffee shop, a pizza and wine bar, a Japanese restaurant, a Shake Shack, afrozen yogurt shop, a credit union, and an artist supply store. The project also included a $1.5 million campus bookstore renovation that Barnes & Noble funded, which involved relocating the bookstore entrance to increase foot traffic. The Chestnut Square development, the first of its kind at Drexel University, added 361,000 square feet of high-quality student housing and retail to campus, at no cost to the university, in exchange for the annual ground rents that ACC will pay over the life of the contract term. The type of financing used guides the term lengths for public-private partnership (P3) projects like this one. Debt financing tends to have shorter term lengths than equity financing. At Drexel, we are using equity as a key component of financing P3 projects. These types of contracts typically have 40- to 50-year base terms, with options that can stretch out to 70 years. American Campus manages and operates the facility under a ground lease with Drexel, and at the end of the term, ownership of the building reverts back to Drexel. There are no first-fill or occupancy requirements built into this agreement. The Summit at University City. The Chestnut Square development laid the groundwork for a second large-scale third-party student housing project, The Summit at University City. This facility is strategically located in Drexel’s primary student housing corridor. Through a competitive process, Drexel again selected ACC as the developer for a 580,000-square-foot complex with 1,316 student housing beds, 18,000 square feet of retail (11 locations), and a 21,000-square-foot student dining facility. This rendering from Drexel’s Campus Master Plan gives a glimpse of the university’s plans to partner with a master developer to transform a 10-acre parcel of land adjacent to its campus and Philadelphia’s 30th Street Station into a dynamic mixed-use Innovation Neighborhood. Opening in September 2015 and valued at $170 million, The Summit represents the largest such project in Drexel and ACC history. While similar to Chestnut Square in that it involves a ground lease, with the ownership of the building reverting back to Drexel at the end of the term, this negotiation was more complex due to the construction and operation of a new dining center component. The agreement included the university entering into a $9.3 million prepaid lease for the dining facility, funded with capital negotiated as part of the university’s campus dining contract. The new campus dining facility will add much-needed capacity to accommodate recent growth in Drexel’s residential student population and food service sales, which increased from $11.8 million in FY07 to $29.1 million in FY14. University Crossings. In a separate transaction tied to The Summit ground lease, Drexel gained control of a strategic piece of land that had been considered the “hole in the doughnut” of Drexel’s campus, because it was surrounded by university-owned property, including a 10-acre parcel slated for future development as the Drexel Innovation Neighborhood. In 2013, ACC conveyed to Drexel the land, air, and subsurface rights to the strategically located University Crossings property, with the option to transfer the building to Drexel’s ownership at any time of the university’s choosing. We were able to structure a transaction in which ACC would convey to Drexel in 2013 the land, air, and subsurface rights to the existing 1,016-bed University Crossings property, with the option to transfer the building (with an estimated value of $68.5 million) to Drexel’s ownership at any time of the university’s choosing. The conveyance also included ACC’s agreement to invest $30 million in improvements to the historic building, which houses student apartments and administrative/office space. 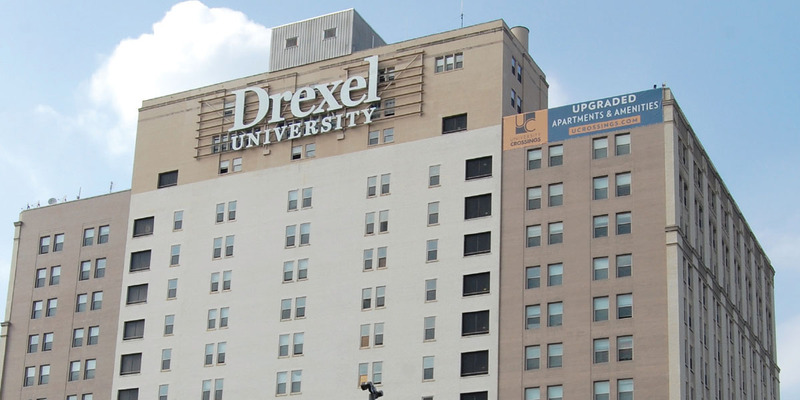 Prior to the conveyance, and as part of the negotiations for the Chestnut Square development, the university secured the rights to install, on the north and south facades of the building’s penthouse, large, backlit “Drexel University” signage with 16-foot-tall letters, a valuable branding opportunity on one of the tallest buildings on campus that has visibility across the city and adjacent transit corridors. 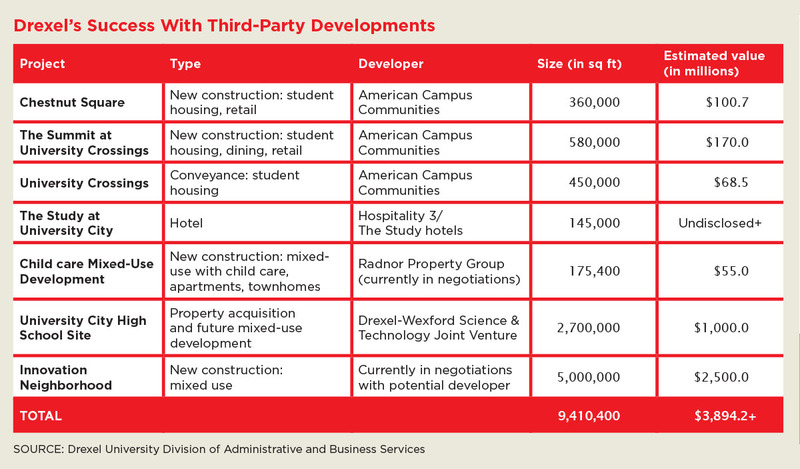 In addition to building additional student housing, dining, and retail space, we identified other facilities needs that we fulfilled through third-party partnerships. The Study at University City. Drexel identified an ideal location for a full-service boutique hotel, with meeting space, retail, and other amenities to serve our community, as well as neighboring institutions. Currently, visitors to the university must stay at hotels affiliated with the University of Pennsylvania or located in downtown Philadelphia, across the Schuylkill River from Drexel’s campus. The planned hotel is expected to attract meetings, group room bookings, and social events; provide a convenient place for visitors and guests of the university to stay; and allow faculty to host conferences on campus covering special topics, such as their work on autism research. Through a competitive process, Drexel selected Hospitality 3 LLC, a New Haven, Conn., and Manhattan-based hotel and real estate development company, to develop the project through a ground lease agreement with Drexel at the company’s sole cost. As with the ACC developments, the building will revert to Drexel ownership at the end of the term. 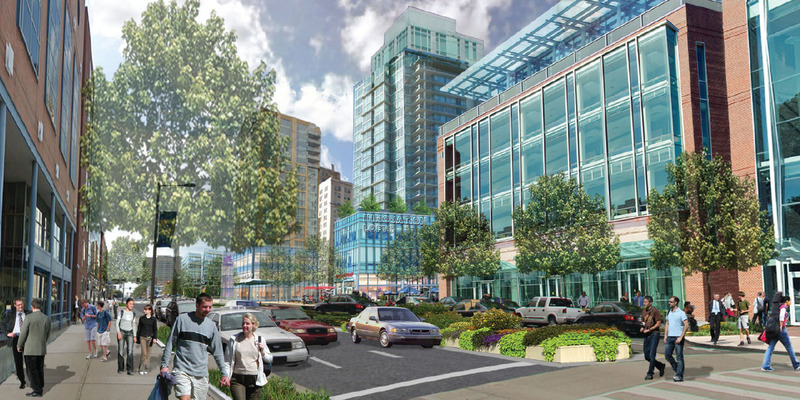 Child care mixed-use development: monetizing an underutilized site. A survey of our faculty and professional staff revealed a significant demand for high-quality child care on campus. An underutilized 0.68-acre site seemed the ideal location for a child-care facility, so we initiated a request for proposal process to seek developer proposals for a mixed-use development on the site that would also include market-rate housing to help make the child-care component economically feasible. That process yielded a proposal for a child-care center, of approximate capacity of 160, to be operated by Hildebrandt Learning Centers, in a 159,000-square-foot, 16-story building. The facility would also house approximately 164 market-rate apartments geared towards young professionals, faculty, university employees, graduate students, and the community at large. The development includes a for-sale stacked townhome component, featuring 12 two-bedroom townhouses eligible for the university’s Employee Home Purchase Assistance Program. The university is currently engaging in negotiations with Radnor Property Group to develop the approximately $55 million project at the company’s sole cost under a ground lease with Drexel. As part of the transaction, the university will also receive one for-sale townhome unit to be used for housing visiting faculty, new faculty, and employees, as well as for hosting small gatherings. University City High School site—a joint venture purchase for future development. In 2013, a unique opportunity arose for Drexel to bid for the purchase of a large parcel of land (14 acres) from the school district of Philadelphia. The parcel was attractive for its adjacency to the west end of campus and the Lancaster Avenue retail corridor, which is part of Drexel’s efforts to spur economic development in West Philadelphia. The university wished to control the site and its future development rather than risk it staying vacant for a long time or being developed for an undesirable use. Since purchasing the site would require substantial up-front capital, the university partnered with Wexford Science & Technology, developer of the University City Science Center, to form a joint venture to acquire the site and manage its development. Under the joint venture agreement formed in early 2014, Drexel owns the land and leases two-thirds of it to Wexford under a ground lease. Wexford and Drexel will develop their respective portions. The existing site includes three buildings: a high school, an elementary school, and a preschool. We finalized the purchase of the site in June 2014, and abatement and demolition of the properties have commenced. Once the site is cleared, there is potential for approximately 2.7 million square feet and $1 billon of development, which is expected to include lab/office, residential, and university space, as well as a potential K–8 school to serve the community. Ultimately, the university’s goals in partnering with Wexford and acquiring the site are to reinvigorate a vacant property with mission-driven development that is a natural extension of the Drexel and Science Center campuses and help to stabilize the neighboring communities by providing economic development and improved public education options. 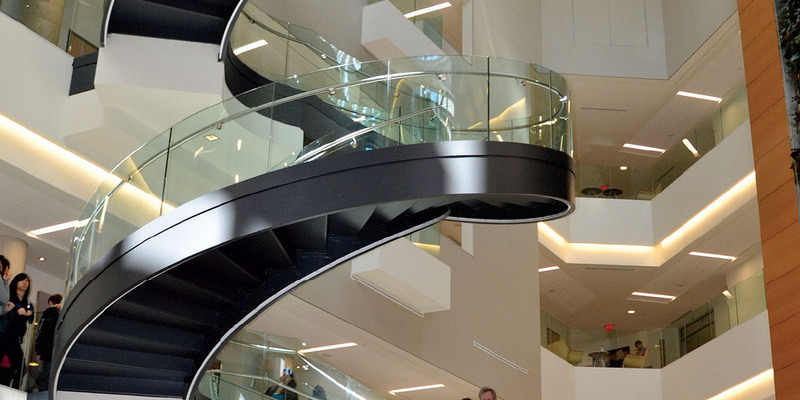 Drexel’s third-party development strategy for campus amenities allows the university to focus institutional investment on state-of-the-art facilities for instruction and research, such as the award-winning Constantine N. Papadakis Integrated Sciences Building. When President John Fry was appointed Drexel’s 14th president in 2010, part of his vision for the university was to transform underutilized properties surrounding Philadelphia’s 30th Street Station into an “Innovation Neighborhood” that would serve as an attractive and exciting front door to Drexel’s University City Campus, as well as a hub for research, technology transfer, and economic development. To that end, Drexel has assembled a large, 10-acre parcel of land with two components—the 528,000-square-foot former Philadelphia Bulletin Building on a 6.5-acre site acquired in 1993 and a 3.5-acre parking lot purchased in 2011. The parcel, dubbed the “Superblock,” includes all the land from 30th Street to 32nd Street and JFK Boulevard to Market Street, which is strategically located directly adjacent to Philadelphia’s 30th Street Station and can accommodate about 5 million square feet of total development, at a cost of approximately $2 billion. The site is located between Philadelphia’s thriving Center City and the intellectual ecosystem of University City (home to Drexel, the University of Pennsylvania, University of the Sciences, and the University City Science Center). In the first step toward attracting third-party partners to help develop the site, Drexel achieved Pennsylvania Keystone Opportunity Zone status for the majority of the land in December 2012, which means eligibility for important tax incentives for office, retail, and hospitality uses. Pennsylvania’s program reduces the state and local tax burden associated with parcels of developable land. Drexel has used the designation program to package sites more attractively for third-party developers. The process for obtaining KOZ status involves submitting applications to the City of Philadelphia Commerce Department that are then analyzed, based on the economic development benefits the project is expected to generate for the city and state, such as potential jobs created and taxes generated. Applications the city viewed favorably are submitted in rank order to the state, which ultimately selects the projects for KOZ designation. Drexel’s vision is to partner with a master developer to transform the parcels into a revolutionary new learn/live/work neighborhood located between one of the nation’s great urban academic centers and the transit hub at the heart of the Northeast Corridor. The Innovation Neighborhood will house technology partnerships, industrial joint ventures, interdisciplinary academic and research programs, business incubators, and more. A mix of offices and laboratories, classroom space, and residential and retail property will create a dense, mixed-use neighborhood. Through a competitive process, Drexel is anticipating selecting a master developer this summer. With third-party developers investing hundreds of millions of dollars in high-quality housing, retail, and amenities on Drexel’s campus, the university has been able to focus and expand capital spending on projects that more directly advance its core academic mission. For example, during the past four years, Drexel has invested in major new academic construction projects, such as the Constantine N. Papadakis Integrated Sciences Building for the life sciences, the Gerri C. LeBow Hall for the LeBow College of Business, and the URBN Center for the Westphal College of Media Arts & Design, as well as major renovations of existing buildings for the psychology department and the School of Public Health. Even when investing university dollars, Drexel is continuously exploring opportunities to creatively maximize those investments through government programs and donor pledges. Donor projects. Drexel has succeeded in attracting donor dollars to further enhance its academic mission for such projects as expanding the Stephen and Sandra Sheller 11th Street Family Health Services Center ($2.5 million pledge in 2014); modernizing the Thomas R. Kline School of Law ($50 million pledge in 2014); upgrading neighborhood initiatives, such as the renovation of the Dornsife Center for Neighborhood Partnerships ($10 million pledge in 2012); enhancing student life by establishing the Raymond G. Perelman Center for Jewish Life ($6 million pledge in 2014); and expanding athletics and recreation facilities ($1.5 million pledge in 2014). State grants. Pennsylvania’s Redevelopment Assistance Capital Program (RACP) allows entities to apply for the state’s limited available capital funding through matching grants for projects that “display significant potential for improving economic growth and the creation of jobs.” Drexel has succeeded in securing RACP grants for the Papadakis Integrated Sciences Building ($10 million RACP/$69 million total budget) and Gerri C. LeBow Hall ($9.5 million RACP/$92 million total budget). Tax credits. Drexel has succeeded in leveraging tax credit opportunities to enhance funding for two major donor-driven projects. The Dornsife Center for Neighborhood Partnerships received a total of $3.8 million in historic and new market tax credits towards its $14.2 million renovation budget, and the Sheller 11th Street Family Health Services Center received $2.8 million in new market tax credits towards its $9.9 million budget. To advance their core academic missions, universities must prioritize large capital investments in infrastructure and facilities, which means projects supporting academics and research will—and should—often take precedence over the development of non-core amenities. But in today’s competitive higher education market, institutions cannot ignore students’ demands for high-quality amenities such as housing, dining, and retail. JAMES R. TUCKER is senior vice president, administrative and business services, and a NACUBO Distinguished Business Officer (2012); JOSEPH CAMPBELL is senior associate vice president, administrative operations; IRENE TSIKITAS LIN is director of communications for administrative and business services, Drexel University, Philadelphia. And by retaining the ownership of the land being developed, universities can collect ground rents from the third-party developer. Drexel University is already realizing the benefits of these types of deals. Through partnerships with private developers that will yield approximately 1.07 million square feet of new construction on its West Philadelphia campus, Drexel expects to receive a total of more than $250 million in ground rents over the life of the contract terms, while adding new, high-quality amenities to the campus landscape with no impact on the university’s credit rating. Embrace transformational leadership. Create extraordinary outcomes by strategically aligning funds, resources, and people to work toward a common purpose and goal. Start with a bold vision and big ideas, and then provide the leadership to produce the best results for the institution’s core mission. Build relationships. Results are linked to relationships, and those relationships must be built on trust, not conflict. Create and build productive networks of people with diverse perspectives, who are willing to collaborate across boundaries (both internal and external) to innovate. Keep an open mind. It is absolutely essential to go into the process with an open mind. No project will turn out exactly the way you thought it would in the beginning—and that’s usually a good thing. Be open to innovative approaches, even those that challenge your preconceived notions, and try to view obstacles as opportunities. A great example at Drexel is the Chestnut Square project, which took a small, shallow strip of land in front of two existing buildings and transformed the streetscape with a residential high-rise tower and mid-rise townhomes, along with more than 25,000 square feet of dynamic, new retail space. Maintain the integrity of the process. 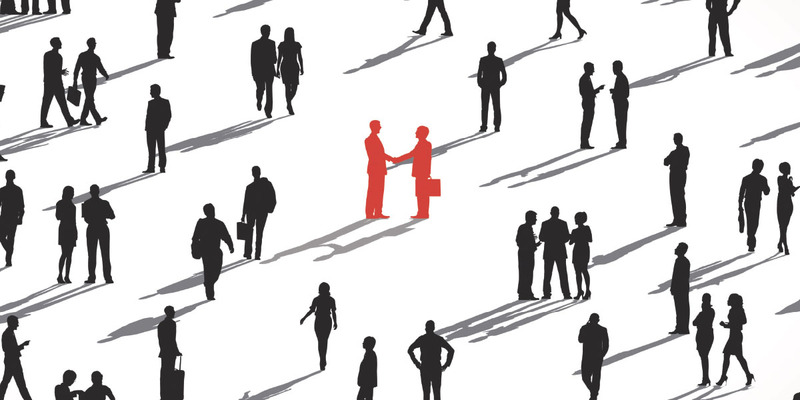 Maintaining the integrity of the process—from procurement to analysis to due diligence—yields the best results. Don’t cut corners or sidestep thorny issues. Remain attuned to the details (especially any potential risks), conduct careful analysis, understand patterns and trends, and use facts to back up your vision. Armed with data and facts, you will be able to enter into negotiations with confidence and dismantle any myths that threaten to impede progress.